It’s been an exciting time lately at Man for all Seasons. For a while now, we’ve been working with a local client, Sharon, who has a great job in TV production. Luke got a call from her last Monday to ask if he’d like to be part of a TV show called ‘The Home Game’. It’s likely to be shown on ITV1 during the day, probably during March or April. 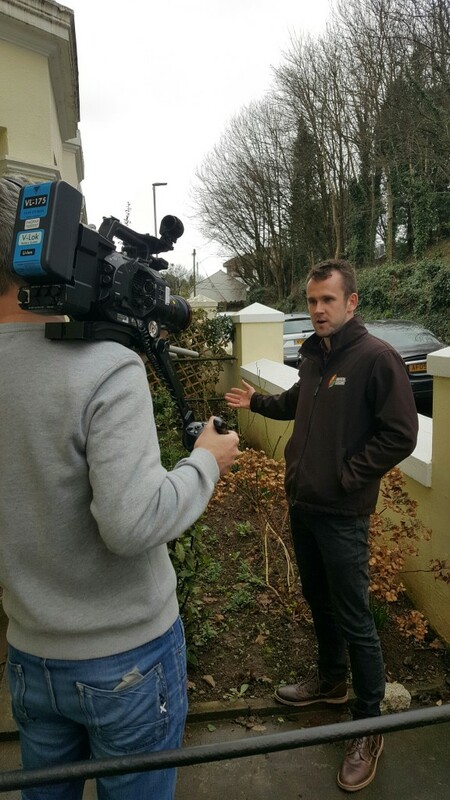 A big part of the show revolves around garden renovations and Luke was thrilled to be asked to make an appearance – but he was understandably a little nervous! So off Luke went to the house in Hartley and helped out in creating a lot of the ‘before’ footage that’s so necessary in these renovation shows. Luke held an interview with Sharon, had an initial chat about the garden and presented some ideas. He also had to explain these ideas to camera. The whole experience was pretty exciting and new! We’re really hoping that Luke’s footage will make it into the cut for the show. We’ll be sure to let you know when it’s airing, so make sure you follow us on Facebook for updates. The project itself involves making something special out of an exceptionally tiny front garden, one that’s typical of a Victorian terraced house. There are hundreds of thousands of these gardens all over the UK and, unsurprisingly, people just don’t know what to do with them. Although we don’t spend an awful lot of time in front gardens like these, they create those all-important first impressions and it’s crucial to get them looking their best. We simply cannot neglect them. So, Luke took some inspiration from the work he’d previously done on the property’s back garden to link the two spaces together. His plans involve building a retaining barrier with sleepers around the edge to define the small space he’s working with. Box hedging will soften the edges of the wood and a Griselinia hedge will help to mask the wall, softening it and providing something much more interesting to look at. He’ll then lay a membrane and put attractive Cotswold chippings in the space between the hedges. To finish off and add a splash of colour, he’ll place a few pots around the gravelled area and fill them with bright, colourful plants. The idea is to get this small space looking tidy, crisp and attractive, without creating much more maintenance for the occupants. Sharon and her family are excited to see the final result, and it’ll make coming home and walking up to the front door much more pleasant. Have you got a garden like this? Small, untidy and lacking any kind of character? Give Luke a call today and talk about your options. There are endless options for any kind of space, and all it takes sometimes is an expert eye. So call today on 01752 312111.